This is a common Hindu festival celebrated on the fourth day of the dark fortnight in the month of Bhadrapada. Also known as Ganesh Chaturthi. No religious function is commenced without invoking Vinayaka or Ganesha, the elephant-headed God with one tusk, the son of Shiva and his consort Parvati. He rides on a rat and helps to remove all obstacles in the path of the righteous, bestowing, wisdom and success. In villages, the earthen images of Vinayaka are prepared by goldsmiths. In towns and cities colourful idols of Vinayaka are available in different sizes. All members of the family take an oil bath and decorate their houses with festoons and rangvali. 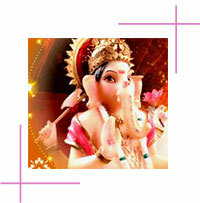 The idol of Vinayaka is worshipped with various flowers, leaves, fruits and corn. The artisans, craftsmen and people of different professions and traders worship the Lord and implement of their respective professions. School-going children put their slates and books marked with Sandal paste and vermilion near the platform of Vinayaka. In towns and cities this festival is celebrated for nine days with bhajans, sports and games. Special preparations called undrallu and kudumulu, the favourite dishes of Lord Vinayaka and his mount Mushaka (the rat), along with payasam, the rice milk porridge, are offered as naivedyam. The floor of the house and the doors are marked in red and white with a double pair of circles symbolising the foot-prints of Vinayaka. Nobody is allowed to take even coffee or tea till the worship of Vinayaka is over and the prasadam of the Lord is taken. On the next day or on the ninth day, the image is taken in a procession accompanied by music and with much pomp to a river tank or well and immersed after it has been worshipped. Some people place the idol in the bed of a tree or a vegetable creeper in their backyards so that it may melt away in the water that is poured for the tree or plant. People avoid seeing the moon on Vinayaka Chaveti to protect themselves against baseless accusations and blame. This is because of the belief that Lord Krishna, while drinking milk saw the reflection of the moon in the drinking bowl. It was as a result subjected to the base less accusation of killing Satrajit for possession of the Samantaka gem. In order to absolved of the evil consequences of seeing the moon on Chaviti, people recite and listen to the legend Samanlakopakhyana from Mahabhagavata.